The fractals are made of three elements, solid, space and border points. The thin fractals are border points surrounded by space, the fat fractals are border points surrounded by solid. I realised that the first 3 rows classify the 2d fractals, and 1d fractals are just the clusters, so the table above should generalise most basic fractals. It reminds me of a periodic table actually. the set of names above gives a much better description of the scene than for instance trying to describe it out of spheres, polygons etc. An interesting thing about fractal shapes is that they really define a behaviour as well as a visual shape. For example, it is inevitable that if you put a cluster into a box and try and see if it has a pressure by squeezing the box, then it will have a pressure, just like a gas. Equally a composite tree will brissle in the wind if there is any wind (force) at all, it will behave like a tree, with the large bows moving slowly and the ends shimmering rapidly. A composite sponge will be squeezable and will return to its original shape... why? because any motion given to the sponge's spokes through squeezing it will distribute into seething vibrations (a temperature) of the shape, and through self collision these vibrations will give the fractal an elasticity. Composite shells are not elastic, since the branching planes prop their neighbours up, so just like their counterpart in nature they are stiff objects, which can encase and protect trees (the shape of most animals) which are flexible. Thin foam has known and measurable surface area for each bubble and a known and measurable volume of the space in each bubble, as such you cannot change these without it becoming a different value fractal. Therefore surface area and internal volume must be preserved, just like a normal bubble. This means that (assuming the bubbles are not perfect spheres) then due to temperature effects the foam will appear elastic (like a sponge) but preserve volume (unlike a sponge). 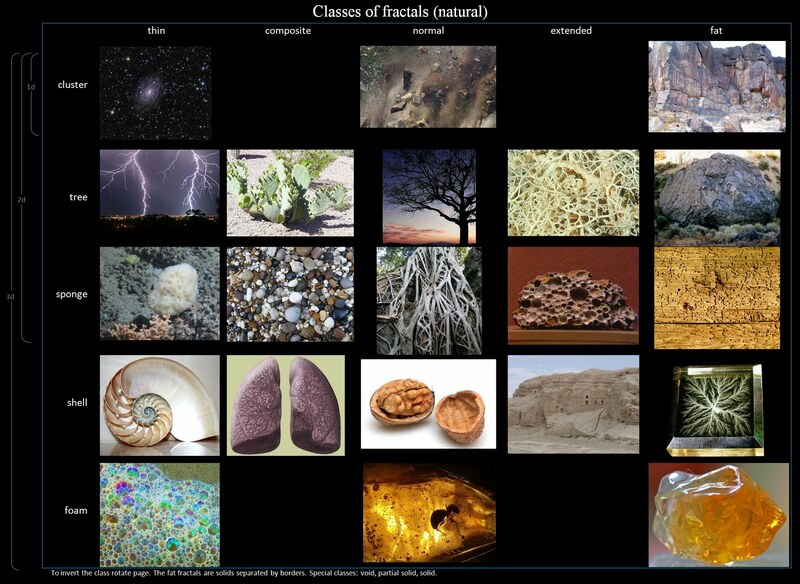 The classification table also has an implied 'empty space' fractal right at the top, and 'full solid' right at the bottom. Between these extremes is a curious fractal that doesn't fit into the table, it occurs where all blocks recurse, none are empty, none are solid (#40 on the 3x3x3m cube). The fractal isn't thin and it isn't fat. It contains no solid, therefore it should act like space and objects can pass through it, but it also contains no space, it has a measurable volume of 27m^3 so this volume cannot change without it being a different fractal. Hence it is volume preserving but not stiff. Its inverse is itself, so is half way between solid and space. It seems to me that this fractal should be called 'liquid', as its behaviour seems to match this description quite precisely. So what I find amazing about these classes of fractals is that, far from being abstract, they really represent the nature of real world objects. A cluster (which is itself a model of gas) has a pressure, sponges are spongey, trees brissle, shells are hard, foam acts like foam. 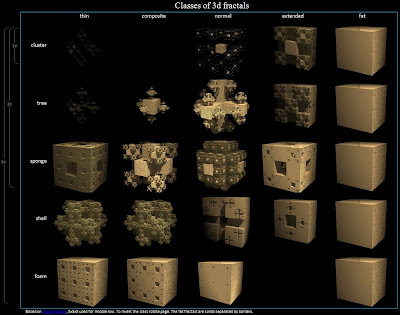 I am not making any concessions here, like pretending solid parts are a bit soft, these 100% precise and accurate mathematical fractals really are spongey, foamy etc, this comes straight from the mathematical definition of each object. 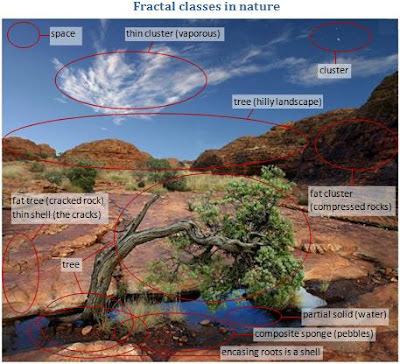 Lastly, under the 'class' category we can give an 'order' to each fractal where the order of a fractal is how many branches it employs each recursion. For example, a binary tree has order 2 and a trinary tree order 3. So higher order fractals are more dense I suppose you could say. The interesting thing about this is the low orders... a tree order 1 has only one branch each recursion, so can give a spiral or cone. A sponge order 1 has only 1 loop attached to the primary loop each recursion and order 1 foam has only 1 bubble attached to the parent bubble each recursion. These are all valid fractals (even if they don't always give a fractional dimension). They follow all the same rules. What about an order 0 tree? well this has no branches, it is just a trunk... a euclidean line/cyclinder/blob. An order 0 cluster? the main blob has no children, so is just a blob. For the thin fractals, the order 0 versions of a cluster, tree, sponge, shell, foam are topologically: point, line, circle, plane, sphere. What this means is that we can classify euclidean shapes with this same system that is used with fractals, they are all one big group. Euclideans are order 0, spirals etc are order 1, fractals are order 2 and above.